Well, this is certainly something different! 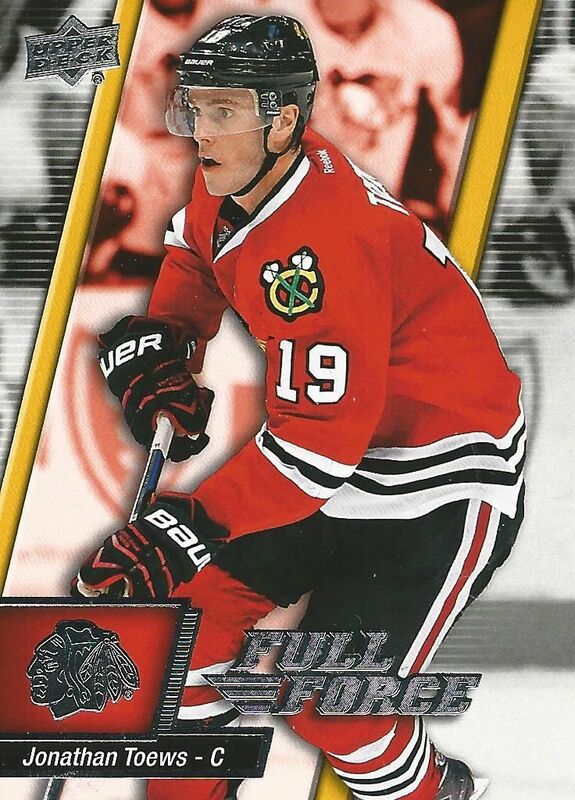 Upper Deck has come out with a brand new product in the form of Full Force hockey. This set sits in the mid-lower-end tier of hockey cards and features inserts that make use of foil and die-cutting techniques. Is this Ultra with a new name? We'll have to take a look at the cards and find out. 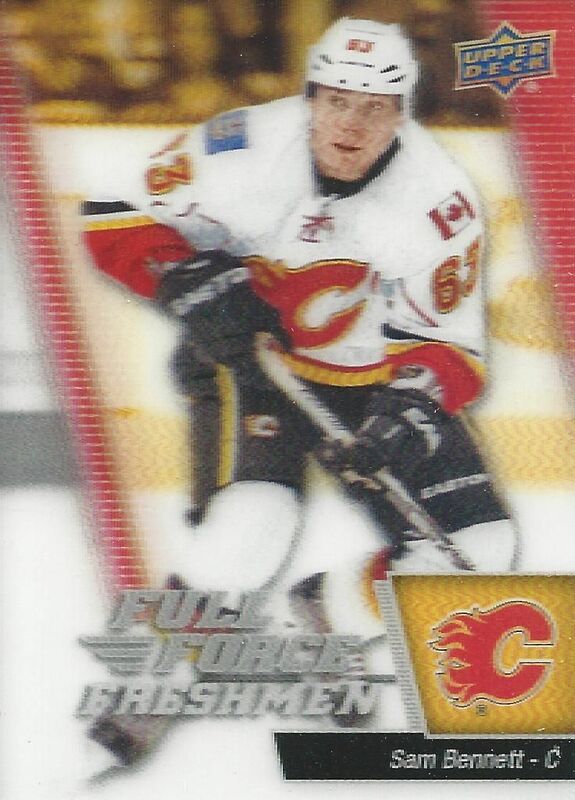 The Full Force base cards are standard glossy type base cards. The cards have a dynamic design that draws attention to the subject by placing it between black and white side sections. Silver foil is also put to use in order to add more presence to the overall card. While the card is certainly not plain, it doesn't do much in the way of simple and modern. Rather, it goes for a style reminiscent of late 90's and early 2000's cards. I personally am not a big fan of this look, but I'm sure there are those out there who are just fine with it. To me this design isn't modern enough and has a been there done that feel. 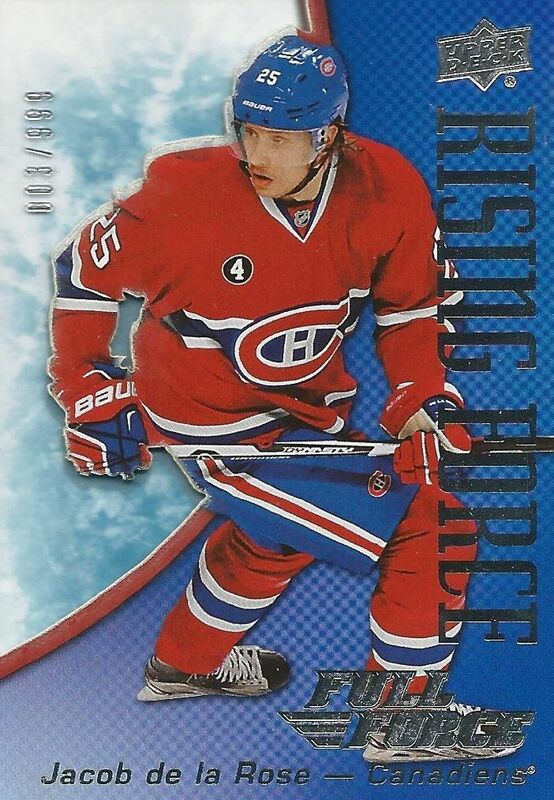 The back of the Full Force base card follows the front pretty closely in design. It has all the relevant information that is needed as well as five lines of statistics. There isn't a write up for the player and the same photo is used on the back. Unless you are really looking for a statistic of a player from within the past 5 seasons, there really isn't much to see here. It's a pretty bland effort. 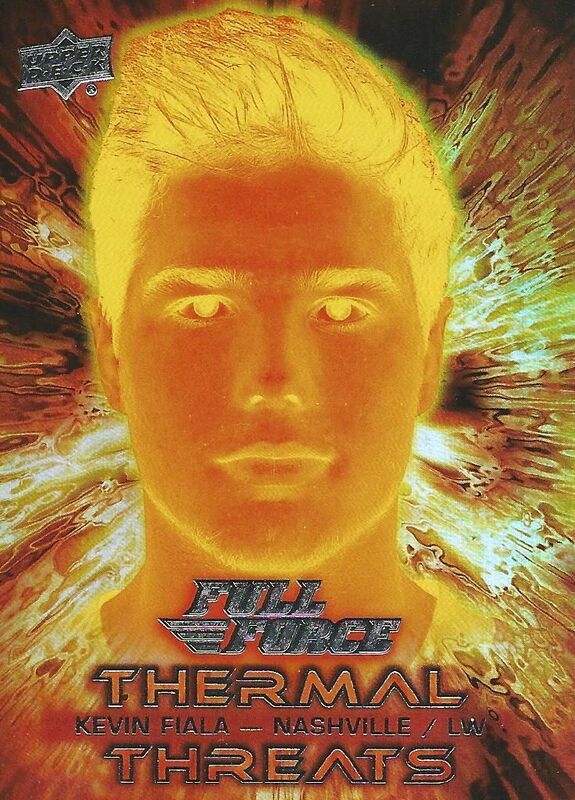 Closing out the main set of cards are the 3D Full Force Freshman rookie cards. The cover of the box makes it seem like these are the cards to find in this product. These rookie cards share a very similar design to the base cards except that they have a 3D look to them. Looking at my Sam Bennett card closely, I don't really get a good sense of 3D. Nothing really 'wows' me here. Even the only Sportflic Baseball cards in the 80's looked cooler. Sadly, there are no hits guaranteed within a box of Full Force. 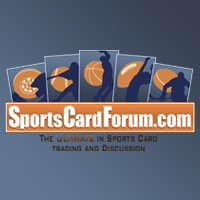 Autographed cards can be found in the product, but just don't come thinking there is one in it. This actually reminds me a lot of Ultra Hockey. There is a heavy focus on inserts cards rather than hits. One of the most common inserts I pulled from my box were the Blueprint cards. I apologize for the scan as it did not come out well, but the cards are shiny and blue, and have a schematic of the player on it. The blueprint cards make an effort to show the specific skills the featured player has. It's certainly a unique idea for an insert card. Valuable Assets are die-cut cards that state why the player on the front is an important part of their team. I'm not exactly sure what the die-cut is supposed to be of and how it relates to being a valuable asset though. I'm sure there is a reason. If anybody know, I'm all ears! Tell me in the comments section! 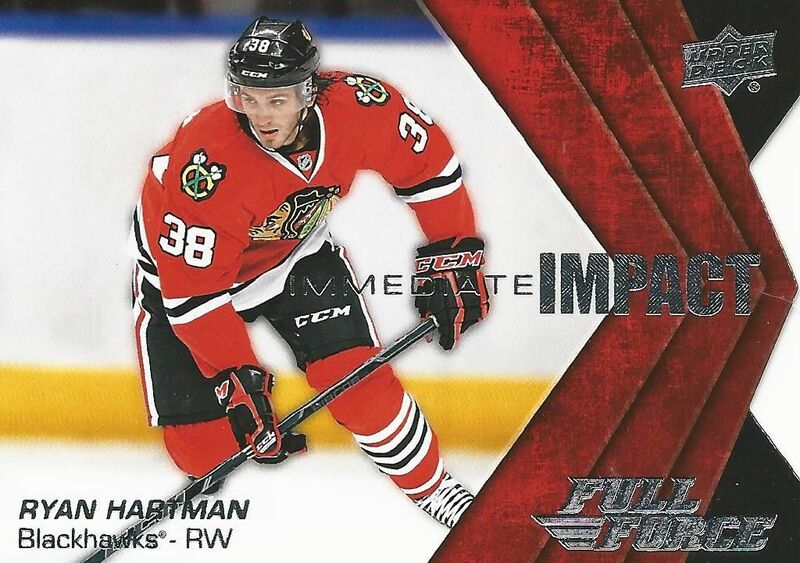 Immediate Impact inserts cards are another horizontal die-cut insert type found in Full Force. 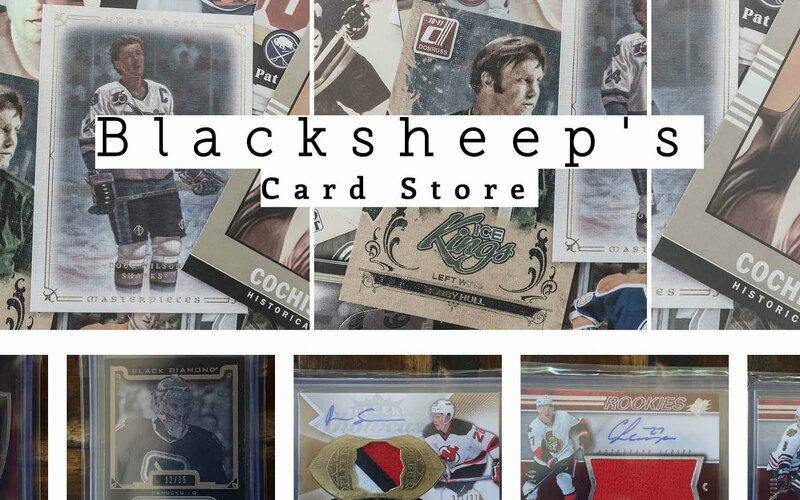 Here collectors can find cards of the younger NHL players. 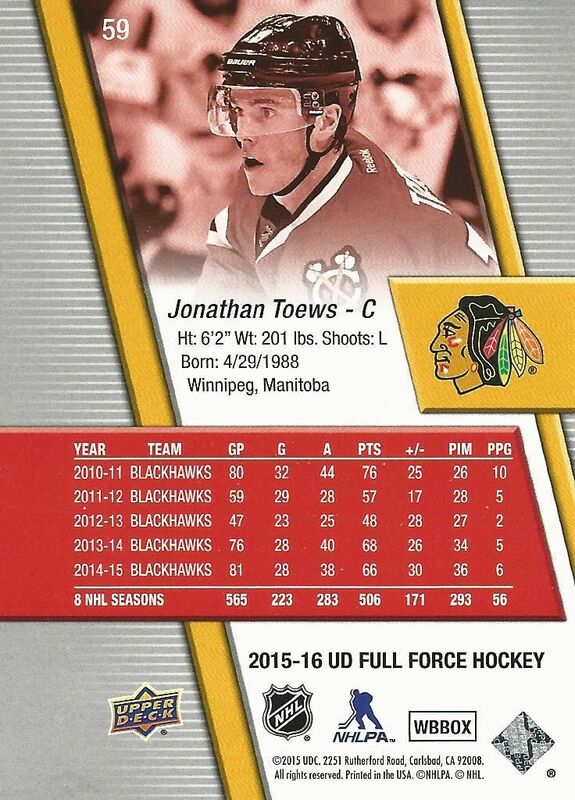 I'm sure Upper Deck has loaded this insert set up with all the biggest named rookies that have hit the ice. I thought these Goooal! inserts were pretty funny. 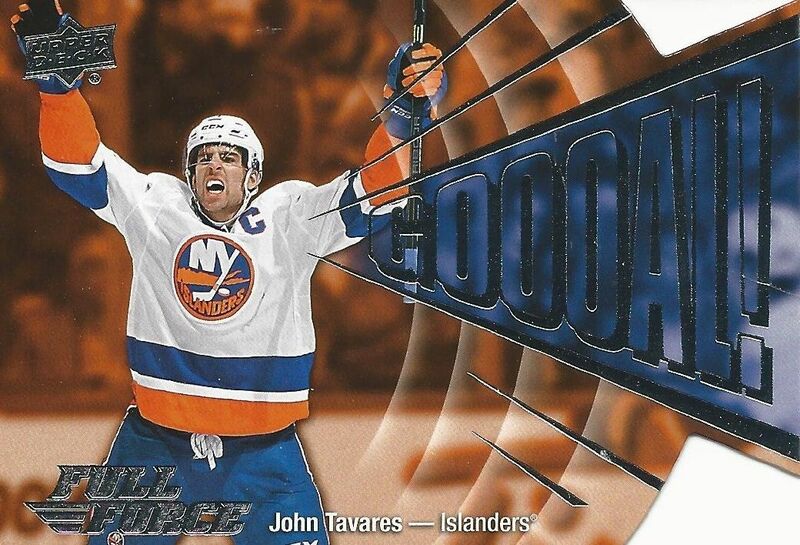 The word goal is in large font almost coming out of the player's mouth. It's a silly card, but somehow endearing to me. 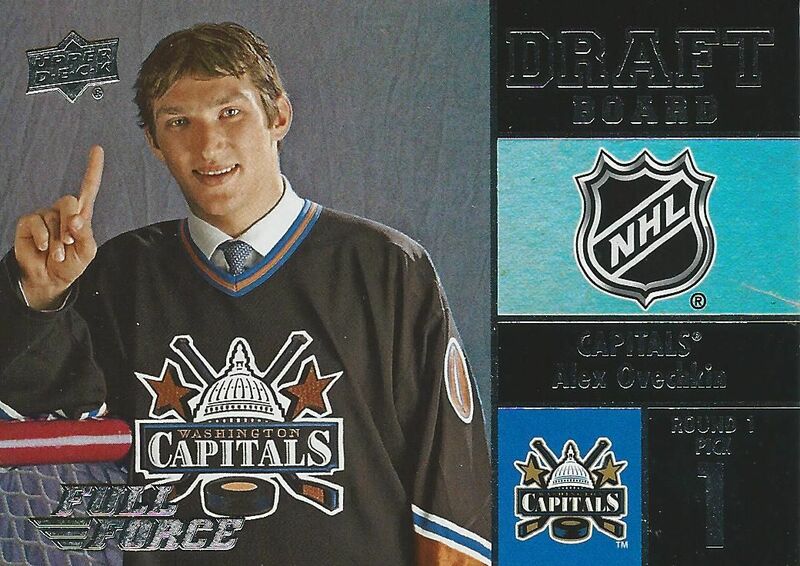 Draft Board cards highlight star players during their time at the NHL draft. These cards look pretty nice with a shiny rainbow foil applied to it. It's always fun to see players when they were just young kids coming into the NHL. They always look so different! Thermal Threat insert cards have to be the must visually arresting cards of the entire set. This insert set makes each player look like the Human Torch from Marvel's Fantastic Four. I'm pretty sure this look hasn't been done before... it's a new idea for sure. I kind of like it, but being such an extreme design will mostly likely cause polarizing reactions from collectors. Probably the best all-around cards in this product are these Rising Force cards. They look like legit Upper Deck cards made from acetate and serial numbered. 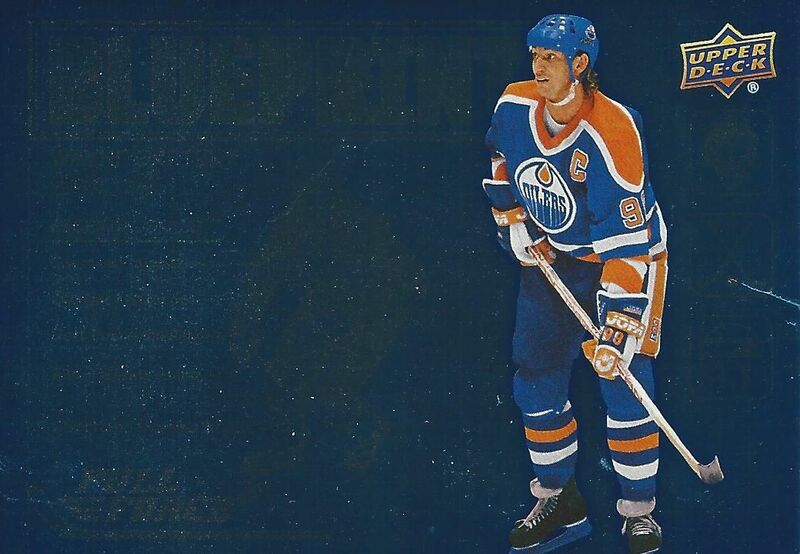 It looks like Upper Deck got this design inspiration from older Skybox products, but at least they chose something that looked good to base things off of. Rather than having unique autographed cards, Upper Deck has affixed sticker autos to many of the standard insert sets found in Full Force. That being the case, it really just seems like hits were an afterthought for this product. UD put all it's money into the quality of the inserts of this brand. Yikes! I have to say that I'm not really a fan of this product at all. When I purchase it, I don't have confidence even in the slightest that I will be receiving something that I will enjoy for that money I paid for it. Inserts and things like that are nice, but today's card collector is looking for something with more punch to it. Everything here is soft. There may be a sleeper insert type in here, but for the most part Full Force is a set that doesn't seem to me like it will stick around long unless there are some drastic changes to it in the future. If you're going to skip a product this year, Full Force might just be the one to do so. I think that you pretty much nailed it when you compared this product to last year's Fleer Ultra. It felt the same to me. Lots of inserts but hits are really hard to get. Pretty expensive for that type of product. Should have been a Low-End product, but it is considered a Mid-End product. I bought some packs... cool to open but not exciting I would say. I totally agree, this reminds me of a Victory. A lot of this reminds of the sets in the 90s. And while I love flashy well designed 90s inserts, its not the 90s anymore, and none of these cards will not go for much more than lunch money. Yeah, this product is proably Upper deck's worst brand. It reminds me of victory but at least victory was cheap and affordable. Full force costs 110$ CAD at my local card store. meh i dont really like this concepts. I think this is definitely a lower end product and a bad idea. Decent looking product, the blueprint cards look pretty cool. Not a fan of the base cards. Good video as always, i like the rising force cards but not the base and other cards. Thanks for the review. I won't be investing too much money in this set. I think those thermal threat cards are kind of cool though. The inserts are cool/new. I like their look. The 3D card isn't that nice. The only thing driving this product is that it contains new Rookies, ie. Connor Mcdavid, Jack Eichel, Max Domi, etc. 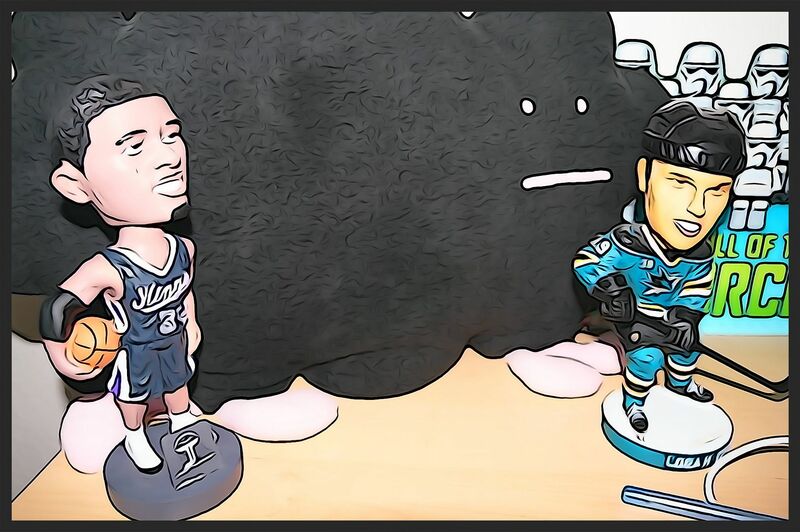 This product's inserts certainly channel the gaudy concepts of the late 1990s (1995-96 SkyBox Emotion, anyone?) and the card design just looks like they took a couple of old Victory designs, tweaked them a bit and added some foil to them. Mehhh. The only selling point for me here are the younger players featured in some of the inserts (like the Virtanen and Hartman types you pulled). Personally like some of the designs of the inserts. I like the cards it's a different approach.